This video gives a peek into the thinking behind the CKB Manifesto and the role of climate knowledge brokers. The availability and quality of climate related information is uneven. It depends on who and where you are. Some are deluged by datasets, reports, scenarios, toolkits and other publications. For others, especially in developing countries, there is still a lack of relevant information. In both cases the result is similar: people struggle to find what’s useful to them in their daily work. Chains of 'knowledge brokers' act as filters, interfaces and translators between knowledge producers and users, across different disciplines, fields and sectors. They employ a range of methods and communication approaches to meet users' needs. Effective brokers recognise that knowledge is often more readily accepted if the knowledge production process is transparent and participatory. You can download the CKB Manifesto from the right-hand column. Please see further resources for an 8-page overview pamphlet, a printer friendly version of the Manifesto, and versions in Spanish. 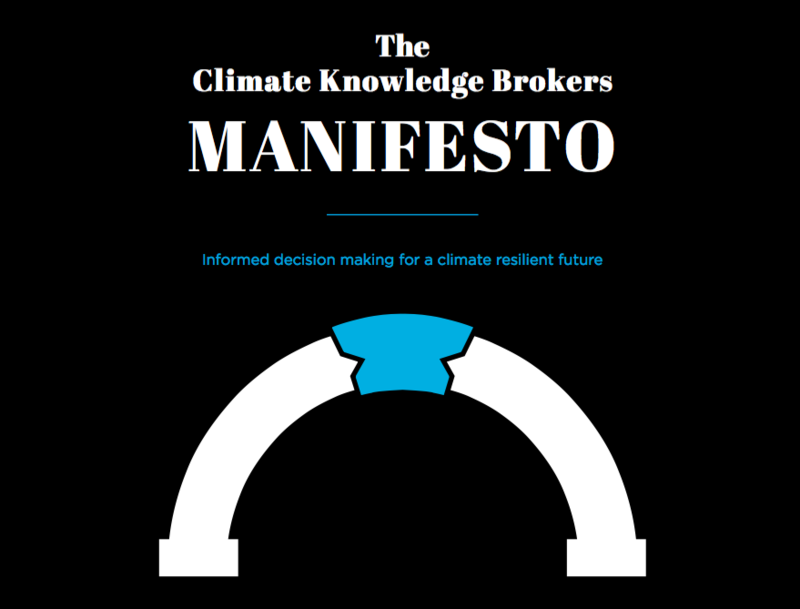 It includes an analysis of user needs, characteristics of the climate knowledge broker role in responding to those user needs, and how the CKB Group can improve the effectiveness of climate knowledge brokering through collaboration. It concludes with an invitation for users of climate knowledge, funders of climate information services and climate knowledge brokers to engage with us. We regard it not as the end of a series of important conversations, but the beginning. We have created a website for this manifesto which, as well as hosting the pdf version, also provides access to transcripts of some of the interviews we conducted and to examples of successful climate knowledge brokering initiatives. It provides links to tools that climate knowledge brokers currently use to provide connections amongst their services. We will continually add content to this website and invite you to use it and share it with others. The CKB website also provides access to transcripts of some of the interviews we conducted and examples of successful climate knowledge brokering initiatives. We support climate knowledge brokers in choosing appropriate tools and methods to address their users' needs, including intelligent use of digital technologies. The Climate Knowledge Brokers group (CKB) aims to help climate knowledge brokers become more effective and efficient in their efforts to meet the information needs of current and future users. We believe this will only be achieved through collaboration, sharing and a commitment to open knowledge. We promote this through a community of practice to enhance trust, build relationships and encourage peer learning. We also coordinate efforts to realise the potential of digital technology for efficient transfer of knowledge at scale. The origins of CKB lie with pioneers in the use of online portals, linked open data and semantic tools. It has since broadened to be inclusive to any organisations and professionals who attempt to deliver tailored climate information to those who need it. We support the intelligent use of climate-related knowledge; we urge the coherent and strategic funding of climate knowledge brokering activities; and we invite the participation of all collaboration- minded climate knowledge brokers. We are collaboration-minded and seek to engage with users of climate knowledge, with funders or potential funders of climate knowledge activities and services, and of course with those who identify themselves as climate knowledge brokers. Interested to know what the weADAPT community thinks of the manifesto principles - any to add, anything people disagree with, or specific techniques you've used in knowledge brokering work? It'd be great to hear any examples of user needs assessments, or successful projects translating climate information or using a knowledge brokering approach! Our work around climate risk communication might also be of interest if you're looking for examples of different approaches to communicate climate information. thanks for this question - we would very much interested in hearing from the community on their thoughts and opinions, and of course knowledge brokering examples!